We're going to Christmas-ify our house this weekend and though I loathe the unpacking of decorations and the hours spent decorating the tree, I love the holidays. Getting together with my family, eating lots of good food, shopping for the perfect gifts, its all part of the fun. But sometimes, the season can feel a little stale. We pull out the same decorations year after year, we always celebrate Christmas Eve at my aunt's house... I thought I'd shake things up (at least virtually!) 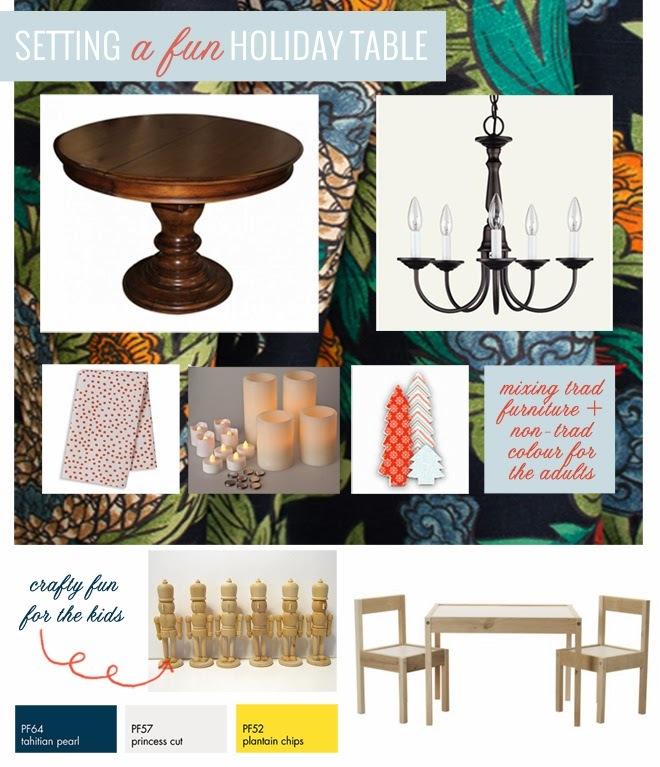 and came up with a fun holiday table. Who says red and green are the colours of the season? You can spark dinner conversation by draping your table in bold luscious tones instead. I'd start with this classic round dining table and pair it with a traditional bronze chandelier overhead. Then I'd lay a tablecloth made of this gorgeous Ming Dragon fabric on top and place whimsical Polka dot napkins at each place setting. I don't like elaborate or large centerpieces (you need room for all that good food!) so I'd keep things simple by decorating with these LED candles and paper trees. And I love the idea of creating a separate table for the kids. Painting wood nutcrackers in modern colours would be fun and keep them occupied until Santa arrives. Have you started decorating yet? What does your annual holiday table look like... traditional? festive? Simple and rustic?